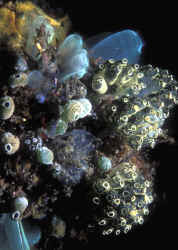 Tunicates, Sea Squirts: Grouped within the same phylum in zoological classification as the vertebrates are a couple of other subphyla of interest to marine aquarists. The Urochordata don't look much like fishes, birds, mammals, lacking a backbone, but do share four other important characteristics with them. During larval development they possess a tail, a dorsal nerve cord, a dorsal (non-bone) stiffening structure (the notochord), and pharyngeal gill clefts. These "lower" chordates are variously called tunicates (for their cellulose matter that makes up their body covering), Sea Squirts (for their apparent and real capacity to forcibly eject water) and Ascidians (Greek for "little body") for the Class of attached forms. There are pelagic tunicates, grouped in the Class Thalicea, but these are of little interest to aquarists. 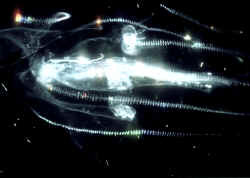 A Thaliacean "Salp". The (Class) Thaliacea include about seventy barrel-shaped pelagic animals that filter feed (like all Urochordates), but from one end opening to the other exiting as they locomote through the water. This Class is further subdivided into three subclasses. The Pyrosomida are colonial and the Salpida and Doliolida are not. The Ascidians on the other hand are a major part of the "cryptic fauna" of live rock... often making up a sizeable proportion of this material (second only to sponges). Though they may not be easily recognized, tunicates are among the most common marine invertebrates, and an important functional component, for aquarists as well. Looking and overlooked as sponges, Ascidians, mostly are likewise attached to the bottom, but bear two sometimes difficult to identify openings, or siphons... incurrent and excurrent, to move water through their individual or colonial bodies. 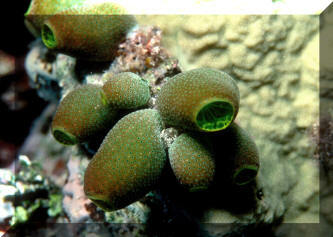 Unlike Sponges, tunicates can/do respond to touch, shadows, other stimuli, by closing these siphons. A solitary species in Indonesia showing a detail of the "gill net" inside the incurrent siphon. This branchial organ serves multiple purposes... allowing for respiration and food gathering, as well as out-gassing of carbon dioxide. 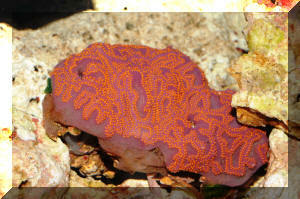 Other Ascidian species are colonial... of many colours, shapes, and variable openings. Aplidium crateriferum Savigny 1816, Crater Sea Squirt. Tropical Indo-Pacific; Red Sea to Western Pacific. 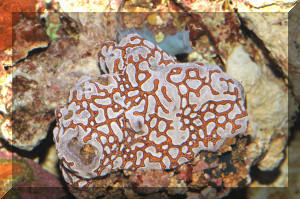 Usually grows under rocks (here a colony is doing well under a Sarcophyton in Australia and one in N. Sulawesi). Can be grown in captivity (even reproduced). Aplidium tabascum. Colonies reddish to orange, opaque. Indo-West Pacific; common in northern Australia. N. Sulawesi pix. Ascidea sydneiensis Stimpson 1855. Yellow-Green Sea Squirt. Solitary urn-shaped zooids of up to four inches in height. Large and few oral siphons. Variable in color. Worldwide in tropical seas. Hawai'i pic. Atriolum robustum Kott 1983. South Africa to New Guinea, Philippines. Small urn-shaped zooids of about an inch in height. Large and few oral siphons. Most are rust-orange or greenish shades. 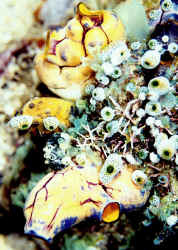 Often confused with Didemnum molle which has much smaller oral siphons. Color due to the endosymbiotic algae Prochloron. Botrylloides species. Row Encrusting Tunicate. Tropical western Pacific to the Red Sea. Low growing colonies with distinctive rows of individuals and round chimneys. Red Sea images. Botrylloides sp. 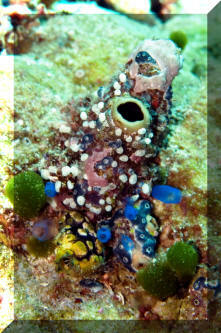 N. Sulawesi (Lembeh Strait) images. Botryllus sp. Geometric Encrusting Tunicates. Several species that share the trait of symmetrical incurrent pores surrounding excurrent. Roatan 2016. TiffB pic.